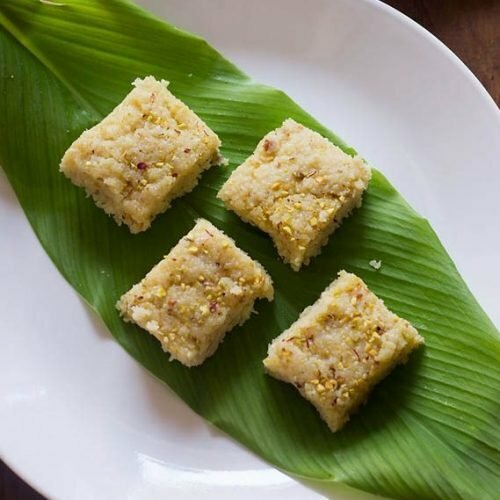 quick nariyal ki barfi recipe - a delicious, soft coconut barfi made from fresh grated coconut, khoya (evaporated milk solids), milk, ghee, cardamom powder and sugar. keep all the ingredients ready for making coconut barfi. grease a tray or thali and place aside. we will use the greased dish to set the coconut barfi. heat 1 tablespoon of ghee in a heavy bottomed pan or kadai. add 2 cups of tightly packed fresh grated coconut. stir well and saute for 3 to 4 minutes on a low flame. the sauteing is done to reduce the moisture from the coconut. don't brown the coconut. add 1.5 cups of milk. mix and stir well. simmer for 2 minutes on a low flame. then add 1 cup sugar or as required. mix very well. next add a tablespoon of chopped pistachios and a pinch of saffron strands. stir again. cook the mixture on low flame for 6 to 7 minutes, till the mixture becomes half of its volume. keep stirring at regular intervals on low flame. the mixture will start to bubble. when the mixture reduces and becomes half of its volume, then add 1 cup of grated khoya. mix very well and keep stirring the mixture on a low flame. sprinkle ½ teaspoon of cardamom powder. stir again. you have to keep stirring the coconut barfi mixture on low flame, till the mixture begins to leave the sides of the pan. also ghee will start releasing from the sides. then switch off the flame. pour the hot barfi mixture gently on a greased tray or dish. take care while pouring the coconut barfi mixture as it will be hot. so use tongs or gloves to avoid any burns. garnish nariyal barfi with chopped pistachios. allow to cool. as it cools down it will thicken and set. once cooled at room temperature, then slice and serve nariyal barfi. store the nariyal barfi in an air-tight jar or box. this nariyal ki barfi stays good for a week in the fridge. cook the barfi mixture on a low flame or sim through out. adding pistachios and saffron is optional.